Find out which stocks pulled the index down last year. 2018 wasn't a good year for the Dow Jones Industrial Average (DJINDICES:^DJI). The index lost nearly 6%, marking its worst losses since the financial crisis in 2008. Yet some stocks saw much poorer performance than the overall Dow did, and that contributed toward pulling the entire average lower. 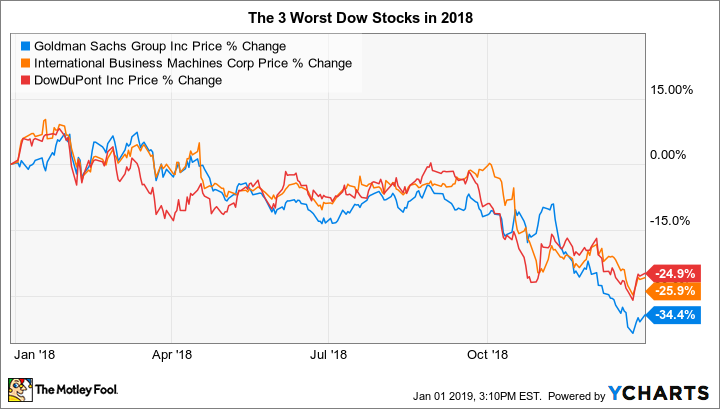 Below, we'll take a look at Goldman Sachs (NYSE:GS), IBM (NYSE:IBM), and DowDuPont (NYSE:DWDP) to see why they were the worst stocks in the Dow in 2018. Goldman Sachs finished the year down 34%, the worst performer in the Dow. A number of things conspired to hit the investment bank hard. Turmoil in the financial markets often leads to volatility for Goldman. In the past, the investment bank has usually found ways to profit from turbulent markets, but it typically takes time for the company's prowess to show up in its financial results. In addition, fears of a recession spell potential trouble for Goldman's banking business. Despite higher short-term interest rates, longer-term rates have fallen, creating a partially inverted yield curve that often precedes recessions. The resulting narrower interest rate spreads also make it more difficult for banks to boost earnings. Finally, Goldman had a key business deal go bad during the year. The Malaysian government is looking to get back hundreds of millions of dollars in fees related to a bond investment fund. Put together, these factors are all weighing on investor sentiment for Goldman. The investment bank has a tradition of bouncing back from adversity, though, so some see 2019 as a potentially strong year for the stock despite some of the macroeconomic threats to the industry. IBM was the second-worst performer in the Dow, posting a loss of 26% for the year. After struggling for years to produce sales gains, Big Blue has still failed to find the consistency that long-term shareholders have wanted to see from the tech giant. In the past, IBM did a good job of recognizing the need to keep innovating to move beyond its traditional areas of strength. Yet that's been a lot more difficult this time around. The company's been ambitious in pushing into cloud computing and artificial intelligence, and its proposed acquisition of Red Hat shows just how committed IBM is right now to squeezing as much potential out of the cloud as possible. Yet for conservative investors who got comfortable with IBM as a tech stalwart, there's plenty of risk associated with trying to identify the top growth drivers of the future. It'll take better results to reassure IBM shareholders that things are improving. Finally, chemical giant DowDuPont finished 2018 down almost 25%. For many investors, investing in DowDuPont is a waiting game right now, as the newly merged company now expects to break itself up into three separate companies. Later in 2019, investors will own stakes in businesses focusing on agricultural technology, materials science, and specialty products. Yet some of those following the stock think that DowDuPont is going about its breakup the wrong way. One activist thinks that there should be six surviving pieces rather than three in order to maximize shareholder value, while others point to the potential to sell off underperforming businesses in advance of the spinoff. Until that gets clearer, DowDuPont stock could remain under pressure going into 2019. Will these stocks lift the Dow in 2019? Turnaround candidates often help support the Dow, and each of these three companies has the potential to bounce back strongly. I'd argue that Goldman is best placed to do so among the three, because it has the most experience dealing with similar challenges in previous business cycles. By contrast, IBM and DowDuPont are going through unique difficulties that require innovative thinking. It's rare for the Dow to fall two years in a row, but if it wants to find success, it'll need help from these stocks. Otherwise, investors could find themselves having to deal with losses again in 2019. Check out the latest Goldman Sachs, IBM, and DowDuPont earnings call transcripts.